We’ve been moving right along in the Internet Course, and it’s starting to find a nice rhythm. Last week the panelists led a lively, engaged discussion on the topic of consumption and creation on the internet. This week we’re talking about intellectual property and fair use, and that discussion has been excellent thus far. Looking forward to more from the panelists tomorrow. In the mean time, the class has been working on is creating a HTML page. I didn’t teach them any HTML, they were instructed to go out and find a tutorial and then compose their own HTML page in a subdomain. I figured we’d spent a lot of time last week talking about creation and consumption on the internet, so this would be an opportunity for them to actually do it. I wanted them to create a page in html from scratch with the idea of demonstrating how a few tags and the hyperlink remain the foundation of what connects the various, distributed resources on the web. I also wanted it to be something other than an application. Over the last eight or nine years I’ve been application heacy, and for good reason, but stripping away is good too. A return, if only temporary, to the basic building blocks of the web: text, embedded media, and hyperlinks. Looking through these projects I realized I’m going through a bit of nostalgia for mid-90s web design. I’m totally loving the HTML aesthetic right now. Below are a few examples that were volunteered during class yesterday, and I’m totally grooving on them. 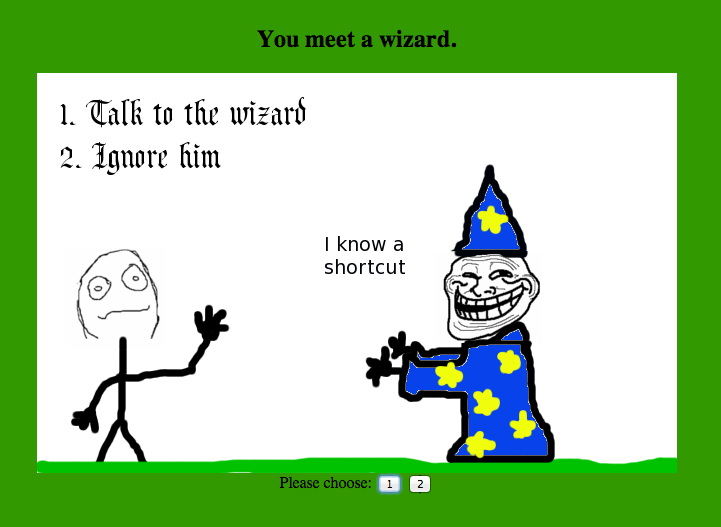 Amber May shared the following choose your adventure site she created for another Computer Science course she took last year. I’m gonna steal the basic code for this because I now want to create a choose your adventure site about this course 🙂 If you have a moment click through and go on a fantastic adventure. Alison Litvin brought back the full beauty of the HTML page with a pink background, purple text, and an animated, 8-bit GIF of a kitten. I’m in love. I included the animated, 8-bit GIF of the kitten separately because it’s that good. 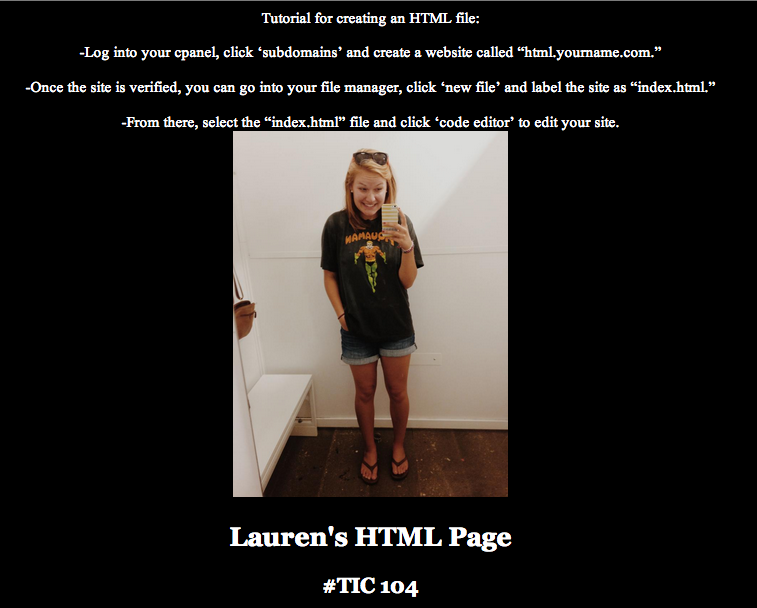 I love how Lauren Brumfield updated the HTML aesthetic with a selfie—this is the New Aesthetic people! Jack Hylan goes retro contemporary with animated GIFs of The Lego Movie. Three out of the four students above used Code Academy for learning HTML (thanks to Jack Hylan sharing it on his blog early on), and they seemed fairly happy with the process. What’s intersting to me is ten or fifteen years ago we would have had entire sections of a course (or a workshop) dedicated to showing students (or faculty) how to compose HTML. Now it seems relatively normal to offload this process to a web-based learning resource like Code Academy. It’s a simple, yet important, acknowledgement that the resources the above students used to learn HTML were not those I was pointing to directly or writing as a custom tutorial, but resources they were sharing with each other as a matter of course. That’s pretty cool, and it expands the course that much more rather than shutting it down or making it obselete. 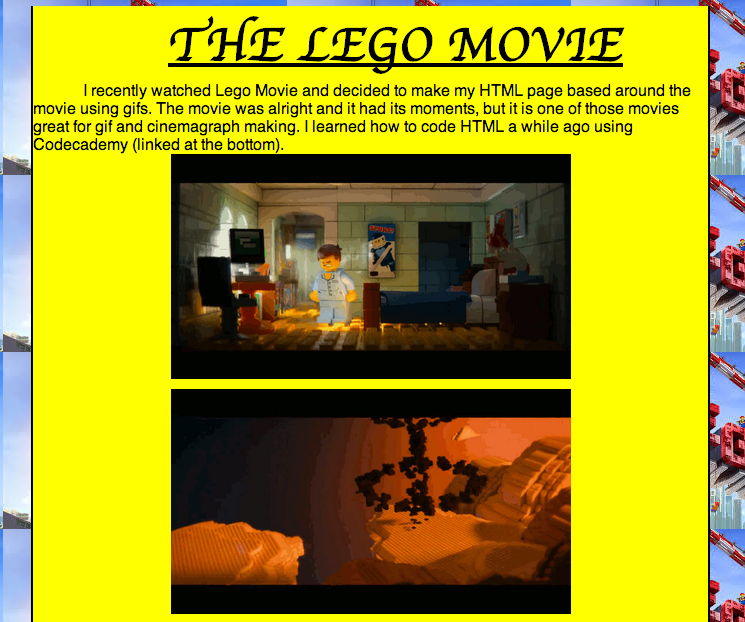 This entry was posted in The Internet Course and tagged html, tic104. Bookmark the permalink. Many kudos to Jack for sharing that. We set this course up as a collaborative investigation, and I love the way that spirit is taking hold and manifesting itself in ways like this. We may be building the plane in the air in some ways, but more importantly, we’re training them all to be pilots. “We set this course up as a collaborative investigation” – awesome. heck yeah the gif deserves it’s own spot! and yes there’s definitely something… nostalgic I guess is the right word about the basic HTML page. I had never done HTML coding ever before and honestly learning it myself through online tutorials was probably the best way to go about it since I could go at my own pace and all that good stuff, so kudos there!! You are bold with your bolding, and thanks for comemnting on the bava, Alison, you are representing for #tic104. What’s more, your kitten GIF rules.